Its’ all happening in Winter Olympics - Loch does not make it three in a row and that costly error will undoubtedly dominate the fallout of day two. Loch’s father raced on to the course to console his son, who looks absolutely devastated. ~ not sure whether many would be following this result in Luge !! Luge at the 2018 Winter Olympics is being held at the Alpensia Sliding Centre near Pyeongchang, South Korea. The events are held between 10 and 15 February 2018. A total of four luge events are to be held. The qualification is based on the cumulative world ranking points from the first five world cup events of the 2017–18 season. In Winter Olympics, a total of 110 quota spots are available to athletes to compete at the games. A maximum 37 men, 27 women, and 17 doubles teams will initially qualify. Each NOC can enter a maximum of three men, three women, and two doubles. The host then has the right to enter a competitor in the men's, doubles, and women's competitions provided they meet minimum standards. Then eight athletes will be added, first to fill the highest ranked relay teams who did not qualify individuals in all three disciplines, then the remaining quotas will be distributed equally among the three disciplines. The breaking news is that ~ Felix Loch has blown it on his final run! A solitary mistake saw him finish not even on the podium after three previous flawless runs. The German was reduced to tears and there will be no third title for the two-time champion. Instead, Loch has to settle for fifth, behind Italy’s Domink Fischnaller. It is Gleirscher, the Austrian who impressed ultimately taking the top prize. United States earned their first ever medal in the men’s singles luge. USA’s Chris Mazdzer took silver and Johannes Ludwig, also of Germany took bronze. David Gleirscher struggled to make Austria’s Olympic team and Chris Mazdzer’s season hit rock-bottom less than a month ago. 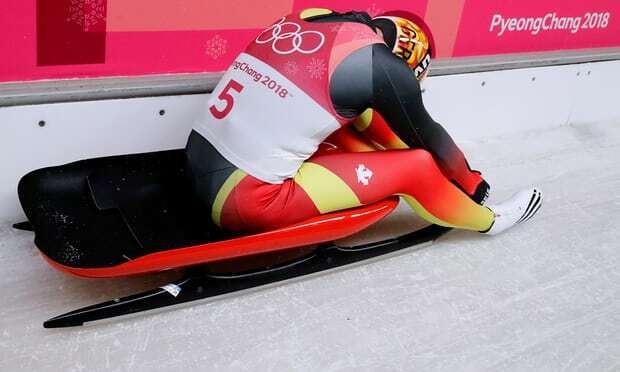 In the end it didn’t matter: they finished with gold and silver medals respectively as the Olympic reign of Germany’s Felix Loch came to a stunning and sudden end. Gleirscher was the surprise first-run leader and a bigger surprise as the leader when it was all over. He finished his four runs at the Alpensia Sliding Center in 3 minutes, 10.702 seconds for the gold, Austria’s first in men’s luge in 50 years. Mazdzer made history for the US, giving the Americans their first men’s singles medal by finishing second in 3:10.728. Germany’s Johannes Ludwig took third in 3:10.932. Loch was supposed to be the champion, the one who would tie Georg Hackl’s record as only the second person to win Olympic luge gold three consecutive times. But as snow began to fall, his reign came to an end when he skidded during his final run and lost time. He crossed the finish line fifth, sitting for several seconds on his sled in disbelief and anguish as Gleirscher celebrated his upset win. Gleirscher has never finished better than fourth in a World Cup event. On the biggest stage, he delivered the race of his life. And Mazdzer did the same. India's winter sports poster boy Shiva Keshavan on Sunday brought the curtains down to his Olympic career with a 34th-place finish in the men's luge singles event of the Pyeongchang Winter Olympics. Taking part in his sixth and last Olympics, the 36-year-old Keshavan produced the best timing of his campaign as he covered the 1,344 metre track at the Olympic Sliding Center in 48.900 seconds in his third round heat. The effort put him at 30th in the third heat among 40 competitors and 34th overall after three rounds. Since Keshavan finished outside the top 20 after three runs, he did not get to compete in the fourth and final run, which decided the medals. As soon as Keshavan crossed the finishing line, he made a broad smile towards the seizable Indian supporters, including his family members. He lifted his sled over his head and waved to the crowd for one last time. The Indian supporters were holding the national flags and placards which had 'Go Shiva' and 'Nothing can stop the fire' written on them. The man from Vashisht near Manali has been the face of winter sports in the country for more than two decades, and had said just before the Pyeongchang Games that this Winter Olympics will be the last international event of his career. This was not though his best ever performance in a Winter Olympics. His best was the 25th place finish in the 2006 edition in Turin, Italy. He is the reigning Asian champion in luge and the speed record holder. He has won Asian Luge Championships in 2011, 2012, 2016 and 2017.